'House with Doors and Windows' is a collection of texts describing (fictive or real) spaces, exploring the theme of architecture in relation to memory and storytelling. 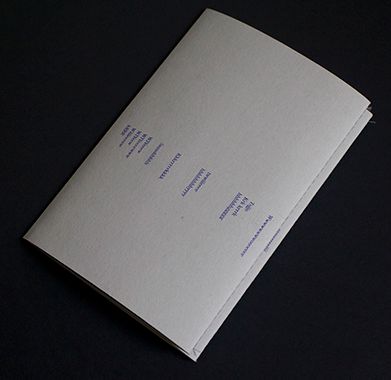 The publication consists of a screen printed cover housing two separate risograph print signatures. This layout enhances the spatial experience that the texts evoke, as well as dismissing a chronological or linear structure in the order of the contributions. With contributions by Diana Duta, Jacob Dwyer, Paoletta Holst, John Holten, Michiel Huijben, Maja Popovic & Boba Stanic and Raf Rooijmans.